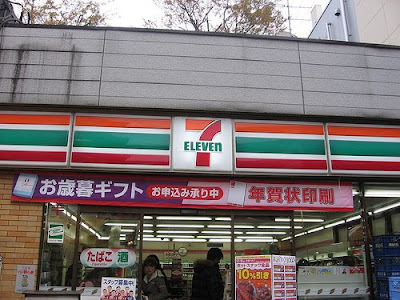 Konbini (コンビニ), short for "Convenience" (the Japanese language doesn't differentiate between Vs and Bs), are the Japanese take on the UK's Tesco Express/Sainsbury's Local/etc (or Springfield's Kwik-E-Mart) but with the odd distinct difference. On the counter are hot snacks including fried snacks such as corn dogs, delicious steamed buns, and even tentacles simmering in fish stock. There's always a vast array of manga, soft drinks, energy drinks and alcohol, as well as pudding cups, bento lunches, and onigiri rice balls. 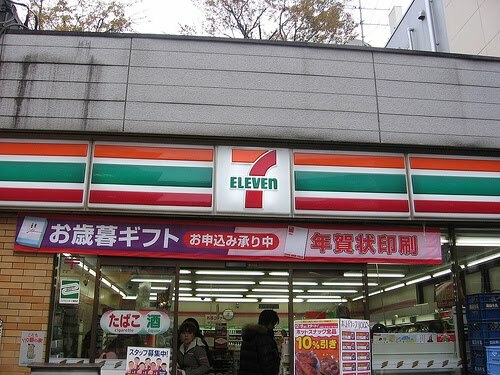 The main players in the konbini world are 7-Eleven, Circle-K, Lawson, FamilyMart and AM/PM. Lawson stores are also equipped with electronic self-serve kiosks where Japanese-speakers can buy, among other things, Ghibli Museum tickets.